No! Whilst many “home doctors” may tell you they do, there is absolutely no truth to this. Corns and calluses generally occur due to friction and do not grow from roots. See our common conditions section for a full explanation. No, most patients do not require a referral. If you have private health cover you should check if your policy covers podiatry. If you are a Department of Veterans Affairs ‘gold card’ holder or a workers compensation client you will need a referral from your GP. GPs can also refer their patients under an Enhanced Primary Care Plan (EPC) to access Medicare Bulk Billing. Do private health funds cover podiatry? Yes, all major Australian health funds cover podiatry. It is important you check your level of cover with your fund. Is Medicare bulk billing available? YES but NOT TO ALL PATIENTS. This cover is for those patients with long term chronic conditions, such as diabetes, long term arthritis, or vascular disease etc. Your GP must provide you with an Enhanced Primary Care Plan (EPC) and nominate Podiatry in that EPC. Please feel free to contact us for enquiries however please be aware this scheme has limited availability. No!! Many people particularly with large corns and callous or even an ingrown toenail, are often surprised they feel little or no pain. Podiatry is the branch of medicine related to foot and lower limb disorders. If it’s related to feet, it is likely our podiatrists will be able to help you. Orthoses are devices put inside your footwear to provide your foot with the most efficient and correct support. In the past orthoses have been known as arch supports, insoles or inserts. There are generally two types of orthoses – over the counter devices such as those sold in shoe shops or at a chemist, and secondly, custom made devices which are far more complex and made from a plaster cast of your feet. What is the difference between a podiatrist and a chiropodist? Not a great deal. Podiatrist is another term for Chiropody. The name change to podiatrist occurred in 1977, and there was an increase in the required level of education. What is the difference between custom made devices and over the counter devices? Over the counter (OTC) devices generally come in 3 or 4 sizes small to extra large. They do not come in different arch heights. Over the counter devices are generally made from fairly cheap materials, and have a much shorter life span, than custom-made devices. They do not cope well with body weight or pressure of walking. These devices are generally excellent at quick and short term pain relief. In fact some heel pain conditions resolve well with over the counter devices as part of the treatment regime. Others however do not! Custom made devices are made from a plaster cast of your feet in combination with a long list of biomechanical measurement, which reveal your feet, legs and body’s best way of running, walking or playing. Materials for custom-made devices are more hard wearing and will last for an average of 2 –3 years. Custom made devices are exactly that “custom made” so may be designed to be accommodated in your footwear more precisely, to suit your chosen sport and activity levels. A good common sense approach involves addressing soft tissue work and orthoses, addressing both the symptoms and why this occurred. Will my child grow out of flat feet? 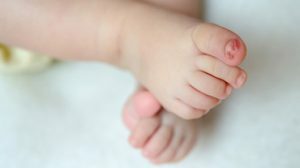 Children are born with flat chubby feet, this is part of normal development. As your child gets older there are many changes to their feet and lower limbs. At approximately 6 years of age, whilst still changing, you would expect to see an arch in their foot. A more important indicator than the appearance of your child’s foot is function. Do they trip more regularly than children their age? Look for bruised and battered knees, pay attention when visiting children their own age. Do they complain of pain? Cause: Most commonly the cause is open backed shoes, such as thongs, sling backs of high heels. Patients. Ingrown Toenails can be very painful and so many people put off seeking treatment until the nail is deteriorated. Painful calluses, corns and cracked heels are commonly experienced during pregnancy, while nails become difficult. © Copyright. All rights reserved. Coffs Harbour Podiatry.